Proprietary Name: Hydroxyprogesterone Caproate What is the Proprietary Name? Non-Proprietary Name: Hydroxyprogesterone Caproate What is the Non-Proprietary Name? Hydroxyprogesterone Caproate with NDC 69238-1797 is a a human prescription drug product labeled by Amneal Pharmaceuticals Of Ny Llc. The generic name of Hydroxyprogesterone Caproate is hydroxyprogesterone caproate. The product's dosage form is injection and is administered via intramuscular form. 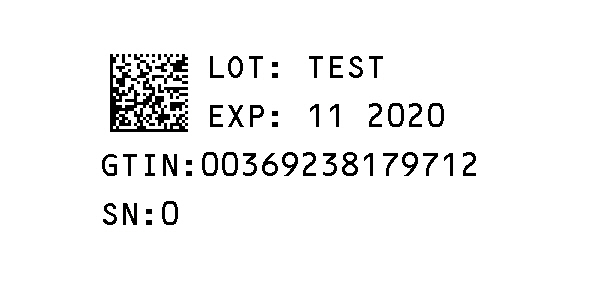 FDA Application Number: ANDA210723 What is the FDA Application Number? Hydroxyprogesterone caproate injection is a progestin indicated to reduce the risk of preterm birth in women with a singleton pregnancy who have a history of singleton spontaneous preterm birth. The effectiveness of hydroxyprogesterone caproate injection is based on improvement in the proportion of women who delivered < 37 weeks of gestation. There are no controlled trials demonstrating a direct clinical benefit, such as improvement in neonatal mortality and morbidity.Limitation of use: While there are many risk factors for preterm birth, safety and efficacy of hydroxyprogesterone caproate injection has been demonstrated only in women with a prior spontaneous singleton preterm birth. It is not intended for use in women with multiple gestations or other risk factors for preterm birth. Parenteral drug products should be inspected visually for particulate matter and discoloration prior to administration, whenever solution and container permit. Hydroxyprogesterone caproate injection is a clear, yellow solution. The solution must be clear at the time of use; replace vial if visible particles or crystals are present. Hydroxyprogesterone caproate injection single-dose vials are only for intramuscular injection with a syringe into the upper outer quadrant of the gluteus maximus, rotating the injection site to the alternate side from the previous week, using the following preparation and administration procedure: Clean the vial top with an alcohol swab before use.Draw up 1 mL of drug into a 3 mL syringe with an 18 gauge needle.Change the needle to a 21 gauge 1½ inch needle.After preparing the skin, inject in the upper outer quadrant of the gluteus maximus. The solution is viscous and oily. Slow injection (over one minute or longer) is recommended.Applying pressure to the injection site may minimize bruising and swelling. Discontinue hydroxyprogesterone caproate injection if an arterial or deep venous thrombotic or thromboembolic event occurs. Allergic reactions, including urticaria, pruritus and angioedema, have been reported with use of hydroxyprogesterone caproate injection or with other products containing castor oil. Consider discontinuing the drug if such reactions occur. A decrease in glucose tolerance has been observed in some patients on progestin treatment. The mechanism of this decrease is not known. Carefully monitor prediabetic and diabetic women while they are receiving hydroxyprogesterone caproate injection. Monitor women who have a history of clinical depression and discontinue hydroxyprogesterone caproate injection if clinical depression recurs. Carefully monitor women who develop jaundice while receiving hydroxyprogesterone caproate injection and consider whether the benefit of use warrants continuation. Carefully monitor women who develop hypertension while receiving hydroxyprogesterone caproate injection and consider whether the benefit of use warrants continuation. Because clinical trials are conducted under widely varying conditions, adverse reaction rates observed in the clinical trials of a drug cannot be directly compared to the rates in the clinical trials of another drug and may not reflect the rates observed in practice.In a vehicle (placebo)-controlled clinical trial of 463 pregnant women at risk for spontaneous preterm delivery based on obstetrical history, 310 received 250 mg of hydroxyprogesterone caproate injection and 153 received a vehicle formulation containing no drug by a weekly intramuscular injection beginning at 16 to 20 weeks of gestation and continuing until 37 weeks of gestation or delivery, whichever occurred first. [See Clinical Studies (14.1). ]Certain pregnancy-related fetal and maternal complications or events were numerically increased in the hydroxyprogesterone caproate injection-treated subjects as compared to control subjects, including miscarriage and stillbirth, admission for preterm labor, preeclampsia or gestational hypertension, gestational diabetes, and oligohydramnios (Tables 1 and 2).Table 1 Selected Fetal ComplicationsPregnancy ComplicationHydroxyprogesterone Caproate Injectionn/NControln/NMiscarriage (< 20 weeks)15/2090/107Stillbirth (≥ 20 weeks)26/3052/1531 N = Total number of subjects enrolled prior to 20 weeks 0 days2 N = Total number of subjects at risk ≥ 20 weeks Table 2 Selected Maternal ComplicationsPregnancy ComplicationHydroxyprogesterone Caproate InjectionN=310%ControlN=153%Admission for preterm labor116.013.8Preeclampsia or gestational hypertension8.84.6Gestational diabetes5.64.6Oligohydramnios3.61.31 Other than delivery admission.Common Adverse Reactions:The most common adverse reaction with intramuscular injection was injection site pain, which was reported after at least one injection by 34.8% of the hydroxyprogesterone caproate injection group and 32.7% of the control group. Table 3 lists adverse reactions that occurred in ≥ 2% of subjects and at a higher rate in the hydroxyprogesterone caproate injection group than in the control group.Table 3 Adverse Reactions Occurring in ≥ 2% of Hydroxyprogesterone Caproate Injection-Treated Subjects and at a Higher Rate than Control SubjectsPreferred Term Hydroxyprogesterone Caproate InjectionN=310%ControlN=153%Injection site pain34.832.7Injection site swelling 17.17.8Urticaria12.311.1Pruritus7.75.9Injection site pruritus5.83.3Nausea5.84.6Injection site nodule4.52.0Diarrhea2.30.7In the clinical trial using intramuscular injection, 2.2% of subjects receiving hydroxyprogesterone caproate injection were reported as discontinuing therapy due to adverse reactions compared to 2.6% of control subjects. The most common adverse reactions that led to discontinuation in both groups were urticaria and injection site pain/swelling (1% each).Pulmonary embolus in one subject and injection site cellulitis in another subject were reported as serious adverse reactions in hydroxyprogesterone caproate injection-treated subjects. In vitro drug-drug interaction studies were conducted with hydroxyprogesterone caproate injection. Hydroxyprogesterone caproate has minimal potential for CYP1A2, CYP2A6, and CYP2B6 related drug-drug interactions at the clinically relevant concentrations. In vitro data indicated that therapeutic concentration of hydroxyprogesterone caproate is not likely to inhibit the activity of CYP2C8, CYP2C9, CYP2C19, CYP2D6, CYP2E1, and CYP3A4 [See Clinical Pharmacology (12.3).] No in vivo drug-drug interaction studies were conducted with hydroxyprogesterone caproate injection. Risk SummaryHydroxyprogesterone caproate injection is indicated to reduce the risk of preterm birth in women with a singleton pregnancy who have a history of singleton spontaneous preterm birth. Fetal, neonatal, and maternal risks are discussed throughout labeling. Data from the placebo-controlled clinical trial and the infant follow-up safety study [see Clinical Studies (14.1, 14.2)] did not show a difference in adverse developmental outcomes between children of hydroxyprogesterone caproate injection-treated women and children of control subjects. However, these data are insufficient to determine a drug-associated risk of adverse developmental outcomes as none of the hydroxyprogesterone caproate injection-treated women received the drug during the first trimester of pregnancy. In animal reproduction studies, intramuscular administration of hydroxyprogesterone caproate to pregnant rats during gestation at doses 5 times the human dose equivalent based on a 60-kg human was not associated with adverse developmental outcomes. In the U.S. general population, the estimated background risk of major birth defects and miscarriage in clinically recognized pregnancies is 2% to 4% and 15% to 20%, respectively. DataAnimal DataReproduction studies of hydroxyprogesterone caproate administered to various animal species have been reported in the literature. In nonhuman primates, embryolethality was reported in rhesus monkeys administered hydroxyprogesterone caproate up to 2.4 and 24 times the human dose equivalent, but not in cynomolgus monkeys administered hydroxyprogesterone caproate at doses up to 2.4 times the human dose equivalent, every 7 days between days 20 and 146 of gestation. There were no teratogenic effects in either strain of monkey.Reproduction studies have been performed in mice and rats at doses up to 95 and 5, respectively, times the human dose and have revealed no evidence of impaired fertility or harm to the fetus due to hydroxyprogesterone caproate. Risk SummaryLow levels of progestins are present in human milk with the use of progestin-containing products, including hydroxyprogesterone caproate. Published studies have reported no adverse effects of progestins on the breastfed child or on milk production. Hydroxyprogesterone caproate injection is not indicated for use in women under 16 years of age. Safety and effectiveness in patients less than 16 years of age have not been established. A small number of women under age 18 years were studied; safety and efficacy are expected to be the same in women aged 16 years and above as for users 18 years and older [see Clinical Studies (14)]. No studies have been conducted to examine the pharmacokinetics of hydroxyprogesterone caproate injection in patients with hepatic impairment. Hydroxyprogesterone caproate injection is extensively metabolized and hepatic impairment may reduce the elimination of hydroxyprogesterone caproate injection. There have been no reports of adverse events associated with overdosage of hydroxyprogesterone caproate injection in clinical trials. In the case of overdosage, the patient should be treated symptomatically. The active pharmaceutical ingredient in hydroxyprogesterone caproate injection is hydroxyprogesterone caproate, a progestin.The chemical name for hydroxyprogesterone caproate is pregn-4-ene-3,20-dione, 17[(1-oxohexyl)oxy]. It has an empirical formula of C27H40O4 and a molecular weight of 428.60. Hydroxyprogesterone caproate exists as white to practically white crystals or powder with a melting point of 120°C to 124°C.The structural formula is:Hydroxyprogesterone caproate injection is a clear, yellow, sterile, non-pyrogenic solution for intramuscular injection. Each 1 mL single-dose vial contains hydroxyprogesterone caproate, 250 mg/mL (25% w/v), in a preservative-free solution containing castor oil (30.6% v/v) and benzyl benzoate (46% v/v). No specific pharmacodynamic studies were conducted with hydroxyprogesterone caproate injection. Absorption: Female patients with a singleton pregnancy received intramuscular doses of 250 mg hydroxyprogesterone caproate for the reduction of preterm birth starting between 16 weeks 0 days and 20 weeks 6 days. All patients had blood drawn daily for 7 days to evaluate pharmacokinetics. Table 4 Summary of Mean (Standard Deviation) Pharmacokinetics Parameters for Hydroxyprogesterone Caproate Group (N)Cmax (ng/mL)Tmax (days)aAUC(1 to t)b (ng•hr/mL)Group 1 (N=6)5.0 (1.5)5.5 (2.0 to 7.0)571.4 (195.2)Group 2 (N=8)12.5 (3.9)1.0 (0.9 to 1.9)1269.6 (285.0)Group 3 (N=11)12.3 (4.9)2.0 (1.0 to 3.0)1268.0 (511.6)Blood was drawn daily for 7 days (1) starting 24 hours after the first dose between Weeks 16 to 20 (Group 1), (2) after a dose between Weeks 24 to 28 (Group 2), or (3) after a dose between Weeks 32 to 36 (Group 3)aReported as median (range)bt = 7 daysFor all three groups, peak concentration (Cmax) and area under the curve (AUC(1 to 7 days)) of the mono-hydroxylated metabolites were approximately 3 to 8-fold lower than the respective parameters for the parent drug, hydroxyprogesterone caproate. While di-hydroxylated and tri-hydroxylated metabolites were also detected in human plasma to a lesser extent, no meaningful quantitative results could be derived due to the absence of reference standards for these multiple hydroxylated metabolites. The relative activity and significance of these metabolites are not known. The elimination half-life of hydroxyprogesterone caproate, as evaluated from 4 patients in the study who reached full-term in their pregnancies, was 16.4 (+3.6) days. The elimination half-life of the mono-hydroxylated metabolites was 19.7 (+6.2) days.In a single-dose, open-label, randomized, parallel design bioavailability study in 120 healthy post-menopausal women, comparable systemic exposure of hydroxyprogesterone caproate was seen when hydroxyprogesterone caproate injection was dosed intramuscularly (1 mL) in the upper outer quadrant of the gluteus maximus.Distribution: Hydroxyprogesterone caproate binds extensively to plasma proteins including albumin and corticosteroid binding globulins.Metabolism:In vitro studies have shown that hydroxyprogesterone caproate can be metabolized by human hepatocytes, both by phase I and phase II reactions. Hydroxyprogesterone caproate undergoes extensive reduction, hydroxylation and conjugation. The conjugated metabolites include sulfated, glucuronidated and acetylated products. In vitro data indicate that the metabolism of hydroxyprogesterone caproate is predominantly mediated by CYP3A4 and CYP3A5. The in vitro data indicate that the caproate group is retained during metabolism of hydroxyprogesterone caproate.Excretion: Both conjugated metabolites and free steroids are excreted in the urine and feces, with the conjugated metabolites being prominent. Following intramuscular administration to pregnant women at 10 to 12 weeks gestation, approximately 50% of a dose was recovered in the feces and approximately 30% recovered in the urine.Drug InteractionsCytochrome P450 (CYP) enzymes: An in vitro inhibition study using human liver microsomes and CYP isoform-selective substrates indicated that hydroxyprogesterone caproate increased the metabolic rate of CYP1A2, CYP2A6, and CYP2B6 by approximately 80%, 150%, and 80%, respectively. However, in another in vitro study using human hepatocytes under conditions where the prototypical inducers or inhibitors caused the anticipated increases or decreases in CYP enzyme activities, hydroxyprogesterone caproate did not induce or inhibit CYP1A2, CYP2A6, or CYP2B6 activity. Overall, the findings indicate that hydroxyprogesterone caproate has minimal potential for CYP1A2, CYP2A6, and CYP2B6 related drug-drug interactions at the clinically relevant concentrations.In vitro data indicated that therapeutic concentration of hydroxyprogesterone caproate is not likely to inhibit the activity of CYP2C8, CYP2C9, CYP2C19, CYP2D6, CYP2E1, and CYP3A4. Hydroxyprogesterone caproate has not been adequately evaluated for carcinogenicity.No reproductive or developmental toxicity or impaired fertility was observed in a multigenerational study in rats. Hydroxyprogesterone caproate administered intramuscularly, at gestational exposures up to 5 times the recommended human dose, had no adverse effects on the parental (F0) dams, their developing offspring (F1), or the latter offspring's ability to produce a viable, normal second (F2) generation. In a multicenter, randomized, double-blind, vehicle (placebo)-controlled clinical trial, the safety and effectiveness of hydroxyprogesterone caproate injection for the reduction of the risk of spontaneous preterm birth was studied in women with a singleton pregnancy (age 16 to 43 years) who had a documented history of singleton spontaneous preterm birth (defined as delivery at less than 37 weeks of gestation following spontaneous preterm labor or premature rupture of membranes). At the time of randomization (between 16 weeks, 0 days and 20 weeks, 6 days of gestation), an ultrasound examination had confirmed gestational age and no known fetal anomaly. Women were excluded for prior progesterone treatment or heparin therapy during the current pregnancy, a history of thromboembolic disease, or maternal/obstetrical complications (such as current or planned cerclage, hypertension requiring medication, or a seizure disorder). A total of 463 pregnant women were randomized to receive either hydroxyprogesterone caproate injection (N=310) or vehicle (N=153) at a dose of 250 mg administered weekly by intramuscular injection starting between 16 weeks, 0 days and 20 weeks, 6 days of gestation, and continuing until 37 weeks of gestation or delivery. Demographics of the hydroxyprogesterone caproate injection-treated women were similar to those in the control group, and included: 59.0% Black, 25.5% Caucasian, 13.9% Hispanic and 0.6% Asian. The mean body mass index was 26.9 kg/m2.The proportions of women in each treatment arm who delivered at < 37 (the primary study endpoint), < 35, and < 32 weeks of gestation are displayed in Table 5.Table 5 Proportion of Subjects Delivering at < 37, < 35 and < 32 Weeks Gestational Age (ITT Population)DeliveryOutcomeHydroxyprogesterone Caproate Injection1(N=310)%Control(N=153)%Treatment difference and 95% Confidence Interval2<37 weeks37.154.9-17.8% [-28.0%, -7.4%]<35 weeks21.330.7-9.4% [-19.0%, -0.4%]<32 weeks11.919.6-7.7% [-16.1%, -0.3%]1 Four hydroxyprogesterone caproate injection-treated subjects were lost to follow-up. They were counted as deliveries at their gestational ages at time of last contact (184, 220, 343 and 364 weeks).2 Adjusted for interim analysis.Compared to controls, treatment with hydroxyprogesterone caproate injection reduced the proportion of women who delivered preterm at < 37 weeks. The proportions of women delivering at < 35 and < 32 weeks also were lower among women treated with hydroxyprogesterone caproate injection. The upper bounds of the confidence intervals for the treatment difference at < 35 and < 32 weeks were close to zero. Inclusion of zero in a confidence interval would indicate the treatment difference is not statistically significant. 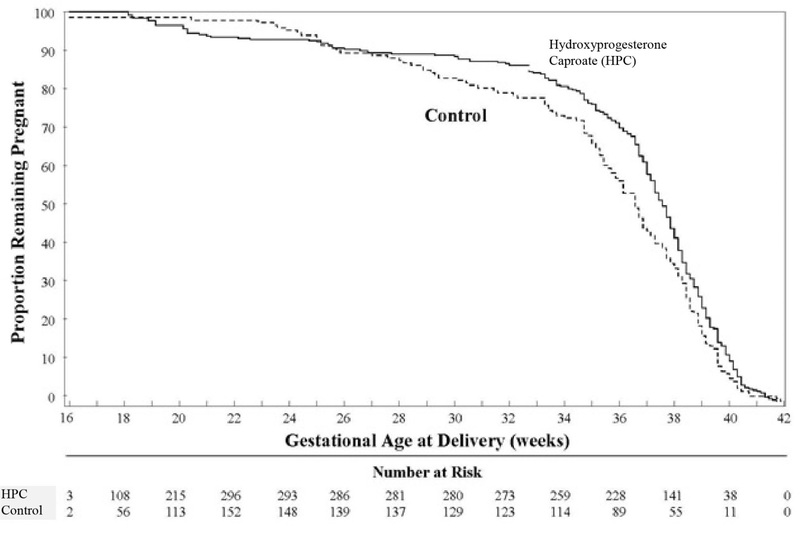 Compared to the other gestational ages evaluated, the number of preterm births at < 32 weeks was limited.After adjusting for time in the study, 7.5% of hydroxyprogesterone caproate injection-treated subjects delivered prior to 25 weeks compared to 4.7% of control subjects; see Figure 1.Figure 1 Proportion of Women Remaining Pregnant as a Function of Gestational AgeThe rates of fetal losses and neonatal deaths in each treatment arm are displayed in Table 6. Due to the higher rate of miscarriages and stillbirths in the hydroxyprogesterone caproate injection arm, there was no overall survival difference demonstrated in this clinical trial.Table 6 Fetal Losses and Neonatal DeathsComplicationHydroxyprogesterone Caproate InjectionN=306 An (%) BControlN=153n (%) BMiscarriages <20 weeks gestation C5 (2.4)0Stillbirth6 (2.0)2 (1.3)Antepartum stillbirth5 (1.6)1 (0.6)Intrapartum stillbirth1 (0.3)1 (0.6)Neonatal deaths8 (2.6)9 (5.9)Total Deaths19 (6.2)11 (7.2)A Four of the 310 hydroxyprogesterone caproate injection-treated subjects were lost to follow-up and stillbirth or neonatal status could not be determinedB Percentages are based on the number of enrolled subjects and not adjusted for time on drugC Percentage adjusted for the number of at risk subjects (n=209 for hydroxyprogesterone caproate injection, n=107 for control) enrolled at <20 weeks gestation.A composite neonatal morbidity/mortality index evaluated adverse outcomes in livebirths. It was based on the number of neonates who died or experienced respiratory distress syndrome, bronchopulmonary dysplasia, grade 3 or 4 intraventricular hemorrhage, proven sepsis, or necrotizing enterocolitis. Although the proportion of neonates who experienced 1 or more events was numerically lower in the hydroxyprogesterone caproate injection arm (11.9% vs. 17.2%), the number of adverse outcomes was limited and the difference between arms was not statistically significant. Infants born to women enrolled in this study, and who survived to be discharged from the nursery, were eligible for participation in a follow-up safety study. Of 348 eligible offspring, 79.9% enrolled: 194 children of hydroxyprogesterone caproate injection-treated women and 84 children of control subjects. The primary endpoint was the score on the Ages & Stages Questionnaire (ASQ), which evaluates communication, gross motor, fine motor, problem solving, and personal/social parameters. The proportion of children whose scores met the screening threshold for developmental delay in each developmental domain was similar for each treatment group. 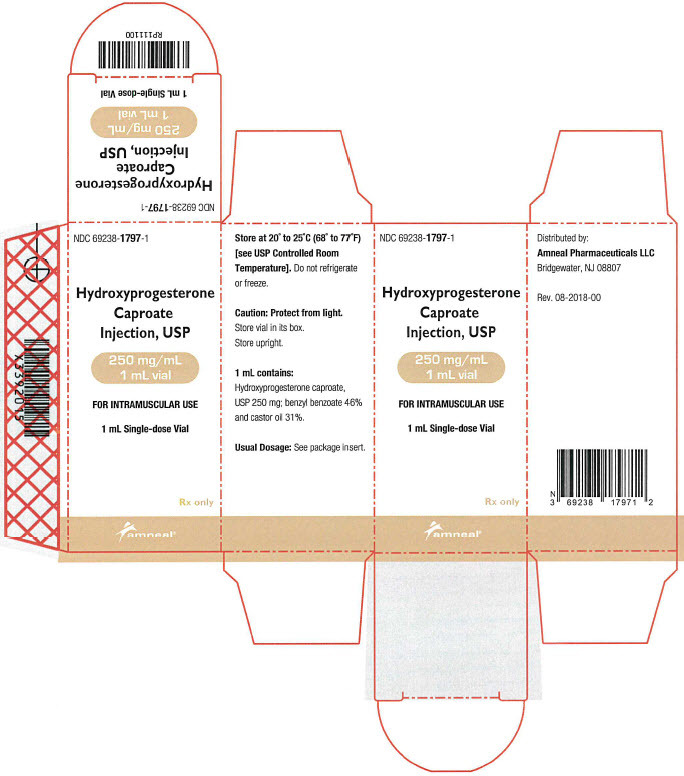 Hydroxyprogesterone caproate injection, USP (NDC 69238-1797-1) is supplied as 1 mL of a sterile preservative-free clear yellow solution in a single-dose glass vial.Each 1 mL vial contains hydroxyprogesterone caproate, 250 mg/mL (25% w/v), in castor oil (30.6% v/v) and benzyl benzoate (46% v/v).Single unit carton: Contains one 1 mL single-dose vial of hydroxyprogesterone caproate injection containing 250 mg of hydroxyprogesterone caproate.Store at 20°C to 25°C (68°F to 77°F) [See USP Controlled Room Temperature]. Do not refrigerate or freeze. Caution: Protect vial from light. Store vial in its box. Store upright.